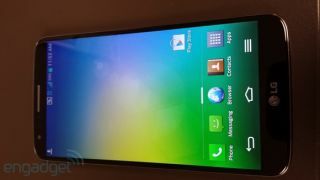 The LG Optimus G2 is being compared to the company's well-reviewed Nexus 4 smartphone, only it's said to be thinner in a new leaked video that was uploaded to YouTube. "Very comfortable in the hand, reminiscent of the Nexus 4 dims, except even thinner," noted the minute-long video description by fittingly-named 4Leakz. LG won't officially confirm the Optimus G2 until its August 7 launch event, if that's indeed what it announces, but the description backs up a slew of photos that a tipster also sent Engadget today. The pictures show off this phone's ultra-sleek body as well as its launcher, camera interface and lockscreen. Today's reports support many of the previously rumored LG Optimus G2 specs that we have heard before. The inside is supposed to have a Snapdragon 800 clocked at 2.3GHz and 2GB RAM, and the latest information points Sprint as the U.S. carrier for the device and a 16-megapixel camera onboard. The LG Optimus G2 is also said to have a 5.2-inch display that's 1080p with a thin bezel, Android 4.2.2, and an volume rocker on the back. The oddly placed volume rocker may be off-putting, but any phone that's compared to the Nexus 4 but thinner stands a chance next to its likely competitors, including Samsung's Galaxy S4 and Apple iPhone 5S this fall.